[PDF] Visualization and Processing of Tensors and Higher Order Descriptors for Multi-Valued Data (Mathematics and Visualization) | Free eBooks Download - EBOOKEE! 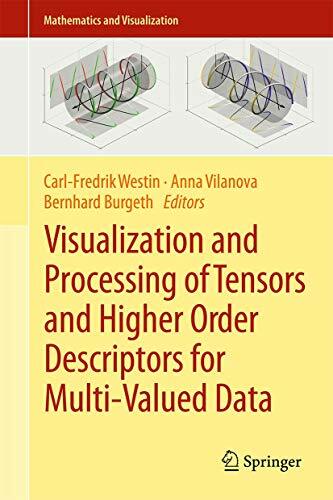 Description: Arising from the fourth Dagstuhl conference entitled Visualization and Processing of Tensors and Higher Order Descriptors for Multi-Valued Data (2011), this book offers a broad and vivid view of current work in this emerging field. Topics covered range from applications of the analysis of tensor fields to research on their mathematical and analytical properties. Part I, Tensor Data Visualization, surveys techniques for visualization of tensors and tensor fields in engineering, discusses the current state of the art and challenges, and examines tensor invariants and glyph design, including an overview of common glyphs. The second Part, Representation and Processing of Higher-order Descriptors, describes a matrix representation of local phase, outlines mathematical morphological operations techniques, extended for use in vector images, and generalizes erosion to the space of diffusion weighted MRI. Part III, Higher Order Tensors and Riemannian-Finsler Geometry, offers powerful mathematical language to model and analyze large and complex diffusion data such as High Angular Resolution Diffusion Imaging (HARDI) and Diffusion Kurtosis Imaging (DKI). A Part entitled Tensor Signal Processing presents new methods for processing tensor-valued data, including a novel perspective on performing voxel-wise morphometry of diffusion tensor data using kernel-based approach, explores the free-water diffusion model, and reviews proposed approaches for computing fabric tensors, emphasizing trabecular bone research. The last Part, Applications of Tensor Processing, discusses metric and curvature tensors, two of the most studied tensors in geometry processing. Also covered is a technique for diagnostic prediction of first-episode schizophrenia patients based on brain diffusion MRI data. The last chapter presents an interactive system integrating the visual analysis of diffusion MRI tractography with data from electroencephalography. No comments for "[PDF] Visualization and Processing of Tensors and Higher Order Descriptors for Multi-Valued Data (Mathematics and Visualization)".